Photo Credit: Georgia Read/Read Studio, Inc.
EcoLox Blue Pond Dye & Lake Dye. FREE SHIPPING on all orders over $100. 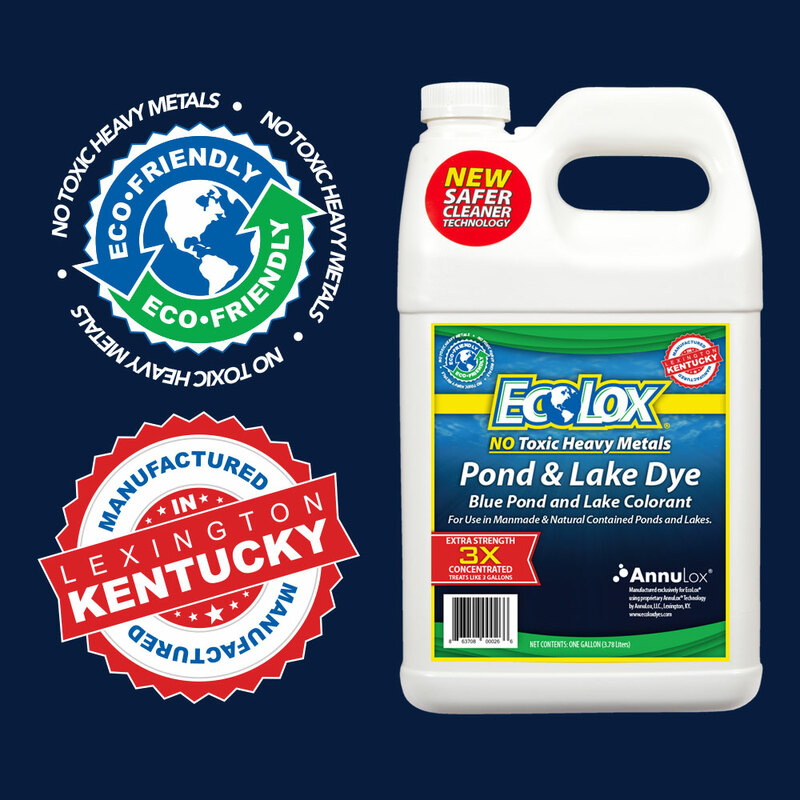 EcoLox Blue Pond Dye & Lake Dye is an aesthetic pond and lake water color enhancer that is completely safe for fish, people, wildlife and the environment. 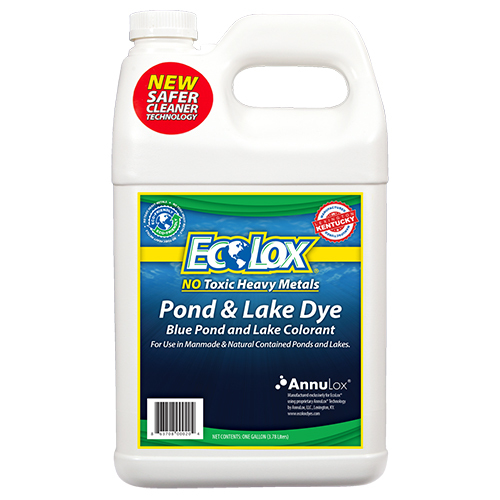 Beautify your pond or lake with the brilliant blue color of EcoLox Blue Pond & Lake Dye. 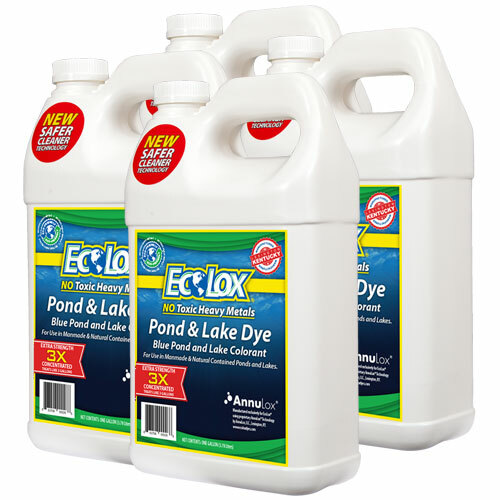 EcoLox Dyes are available in bulk quantities of 30, 55 and 275 gallons. 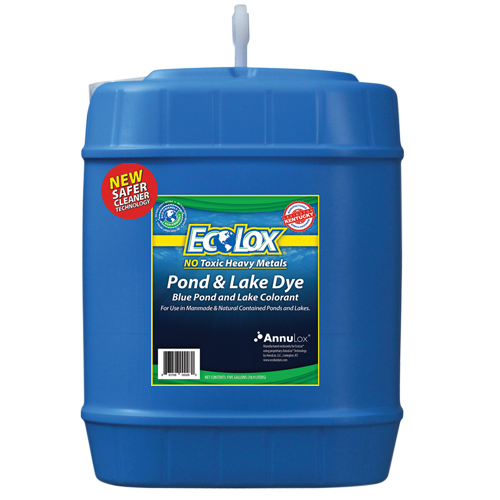 EcoLox Blue Pond Dye & Lake Dye is now offering two different formulations of our blue pond and lake dye product. We now offer an Extra Strength 3X Concentrated version as well as our Original Formula blue pond and lake dye product. Both formulations come in multiple volumes to cover a wide range of our customer’s needs. We also offer both formulations in bulk volumes of 30 gallon, 55 gallon and 275 gallon totes for those larger projects. 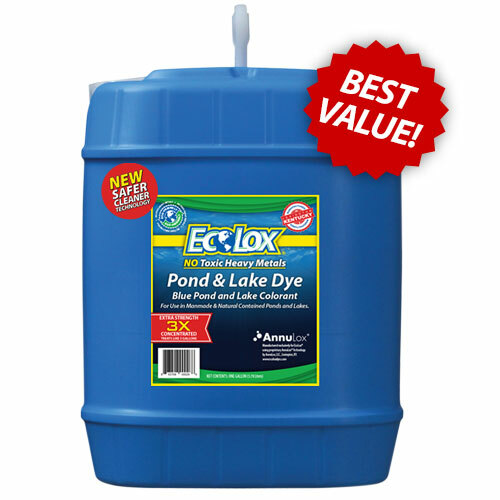 Beautify your pond or lake with the brilliant blue color of EcoLox Blue Pond & Lake Dye today. 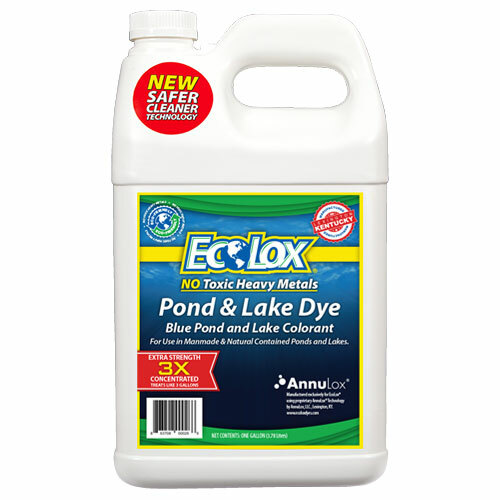 EcoLox Blue Pond Dye & Lake Dye is an Acid Blue 9 based pond and lake dye and aesthetic water color enhancer that is completely nontoxic to fish, water fowl, livestock and humans as well as decorative aquatic surface plants, such as lily pads. Unlike ALL OTHER Acid Blue 9 based pond and lake dyes currently on the market, EcoLox pond dye products are manufactured utilizing AnnuLox® proprietary technology to produce Acid Blue 9 based products without the use of toxic heavy metal oxidants which are present in traditional Acid Blue 9 dye manufacturing processes. This new, manufacturing process offers consumers a “green” alternative for environmentally sensitive applications. 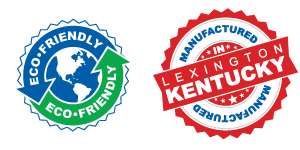 Buy EcoLox products today and help reduce the toxic waste burden to our earth. 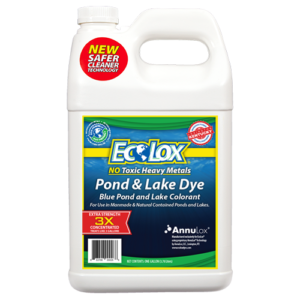 A single gallon of EcoLox Blue Pond Dye & Lake Dye will treat one acre of water, four feet deep (1,300,000 Gallons) for up to 30 days. For more information check our FAQ page or contact us via our contact page. If you’d like to speak with someone about your pond and lake dye needs give us a call at (859) 321-2500.